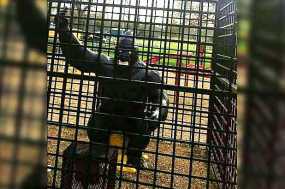 (Newsweek) A much-loved gorilla statue that had been removed from a playground in Corsicana, Texas, following complaints it was racist is set to return following outrage and protests from local residents. The decision was met with outcry from the town’s residents. Online petitions demanding Dobby returned gained thousands of signatures, a Facebook group page In Memory of Dobby got more than 1,000 likes in one day and a candlelit vigil was held in memoriam of the statue where it once stood. In a letter to the Corsicana Daily, long-time resident Betty Lambert said she understood the concerns. She wrote: “The gorilla is a black ape confined in a unbreakable cage. I am sympathetic to the idea that it could be thought of as a metaphor for the institution of slavery. Republished with permission from Newsweek via iCopyright license.